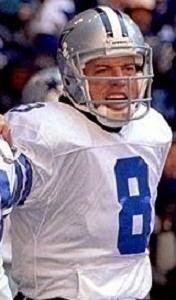 Aikman started off in college at Oklahoma and was starting quarterback as a sophomore until breaking his ankle four games into the season. He transferred to UCLA where, after sitting out a year, he passed for 5298 yards and 41 touchdowns and led the Bruins to a 20-4 record with two bowl victories and received consensus first-team All-American honors as a senior in 1988. The Cowboys chose Aikman with the first overall pick in the ’89 NFL draft and he took over the starting job, showing great toughness with a rebuilding 1-13 team and missing time with a broken finger. A drop-back quarterback with a strong arm, Aikman continued to develop in 1990 and passed for 2579 yards until suffering a late-season shoulder separation that required surgery. Cowboys went 11-5 to finish second in the NFC East and qualifying for the postseason as a Wild Card. Won NFC Wild Card playoff over Chicago Bears (17-13). Lost NFC Divisional playoff to Detroit Lions (38-6). The best was yet to come for Aikman and the Cowboys as the team won three of the next four NFL Championships. Aikman passed for 3445 yards and a career-high 23 touchdowns in 1992 and capped the year by being selected as the Super Bowl MVP. He was chosen to six consecutive Pro Bowls and was a steady, solid leader as well as consistent performer in an offense where he was often overshadowed by RB Emmitt Smith and WR Michael Irvin. But he had five 3000-yard passing seasons and averaged over seven yards per pass attempt six times. The team went into decline and concussions became an issue, forcing Aikman’s retirement in 2000. Overall, he completed 61.5 percent of his passes for 32,942 yards and 165 touchdowns and, in the postseason, threw for another 3849 yards and 23 TDs while the Cowboys won 11 of his 16 starts. Aikman was inducted into the Pro Football Hall of Fame, Class of 2006.